To start out I chose the elements icons I wanted to use. 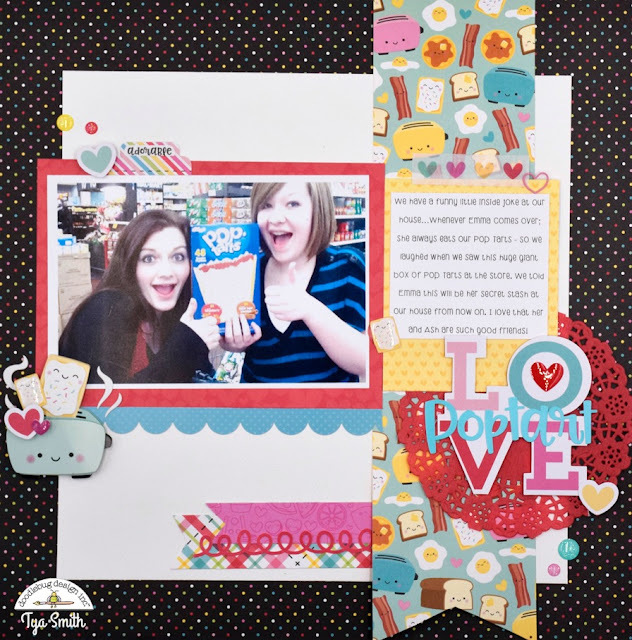 The Toaster Time Doodle-pop was really the inspiration behind this layout - when I saw it I knew I had to use it! The background paper is one of my favorites as well. I love the colorful dots on the black background. I added a strip of adorable Waffley Cute paper and notched the ends into a banner and placed it on the far right side of the layout. I backed my photo with the red heart side of the Soy Happy paper. I added a strip of blue scalloped border sticker from the This and That sticker sheet under the photo. 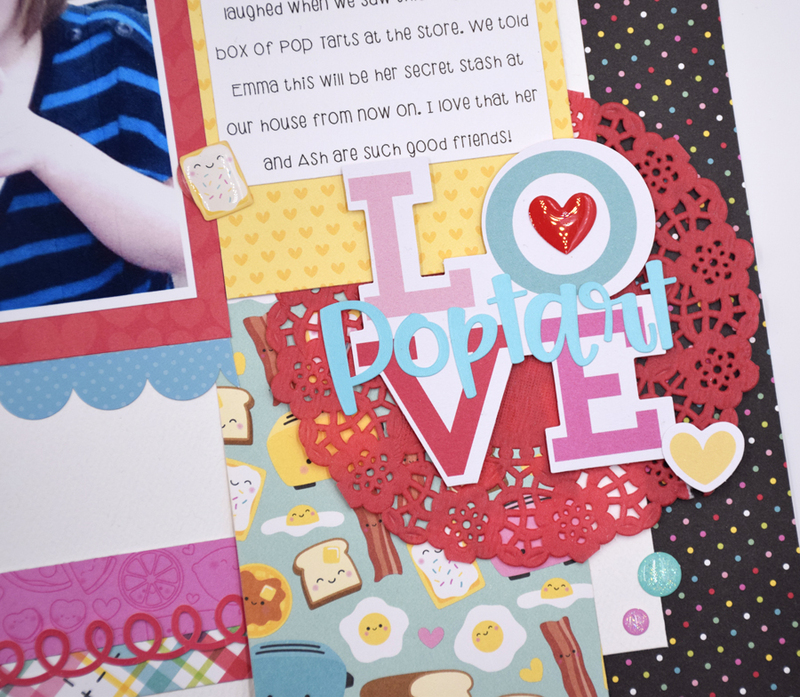 To make my title I turned to the new Chit Chat die cuts and found this fun Love title. I layered some Swimming Pool Abigail letter stickers on the top and added a shiny red heart sprinkle from the Hearts Shape Sprinkles. I placed some foam tape on the title and placed it on a Ladybug Doily to pop it from the background. I added a small yellow heart from the Odds and Ends die cuts as well. 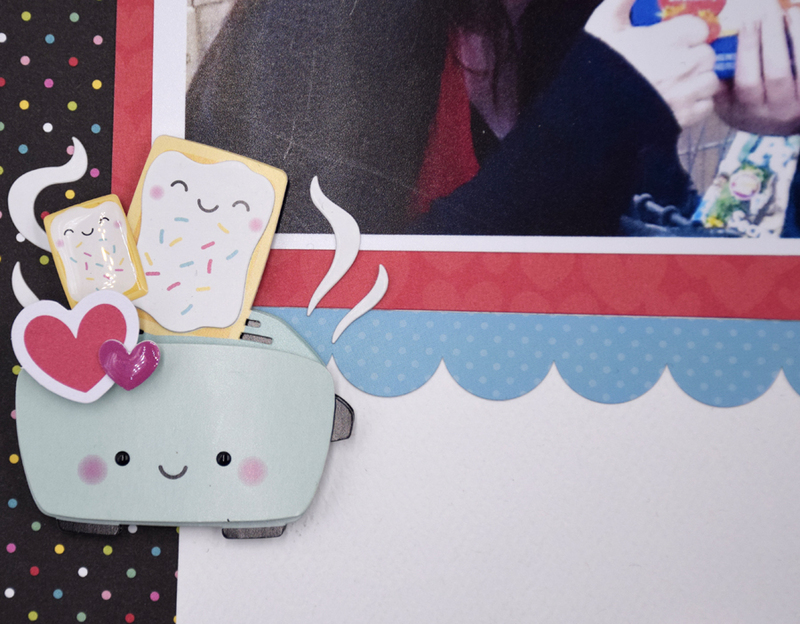 Here's a close up of that adorable Toaster Time Doodlepop . I added another small Pop Tart sprinkle from the Breakfast Buddies pack and then another red heart die cut from the Odds and Ends. Up in the top left corner I added a few glitter sprinkles from the Valentine Assortment sheet and the "Adorable" tab sticker is found on the This and That sticker. Another die cut heart was added here as well with some pop dots. I typed up my journaling on white cardstock and mounted it onto a piece of yellow heart paper from the B side of the Waffley Cute paper. 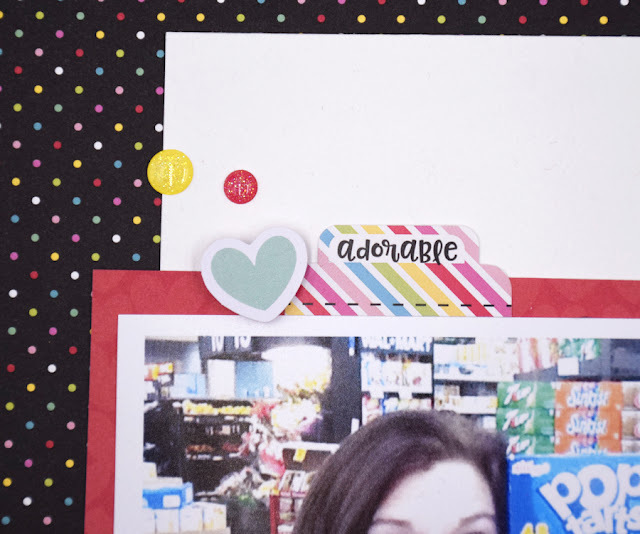 I added a strip of My Love washi tape to the top edge, a small pink heart from the Mini Hearts Cute Clips and to finish the spot off , one more mini Pop Tart sprinkle. This collection is seriously so fun to celebrate some of your favorite snacks and treats. It is such a versatile collection and I am glad I found this cute photo to match! 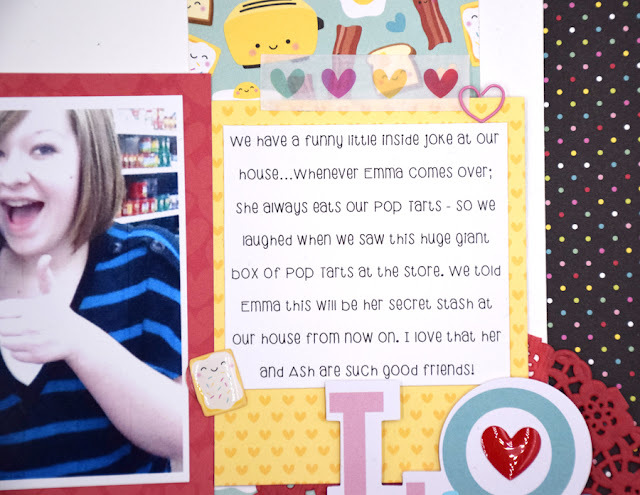 So if you have any treats or foods you like to record your memories about, grab this cute collection and make a page. These memories and little snippets of the small pleasures in life are so worth recording! Thank you for stopping by today and Happy Crafting! This is perfect! I have a pop tart loving teen too!!!! Love how you captured the moment! So Punny | Cut Files have hit the stores! No More Sleeps | It's Reveal Day! A New Year - A New Team!